May start out small, and at first have little effect on your vision. You may notice your vision is becoming more blurred, like looking through a cloudy piece of glass. Retinal changes accompanying long-standing diabetes. Diabetic macular edema is the swelling of the eye’s most vital area, due to leaky blood vessels. This can be detected early with regular eye exams. You may not know you have glaucoma, unless you have regular eye exams. Glaucoma is typically associated with painless and progressive loss of vision that may escape detection by the patient. Macular degeneration is the number one cause of legal blindness in people over 60. Many seniors already have Macular Degeneration and don’t even know it. An eye misalignment is caused by extra ocular muscle imbalance. One eye is not aiming at the same object as the other eye. Most eye injuries such as foreign bodies, corneal abrasions and other forms of injuries can be treated in our office. This can be due to many things, such as work environment, contact lens abuse, allergies and hygiene. There are many reasons for blurred vision. 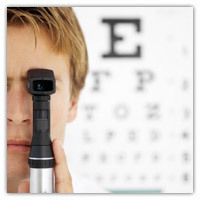 You could have a medical issue or a vision problem that can be corrected with glasses or contacts. VSP, Eyemed, Medicare, Medicaid, Blue Cross Blue Shield, AARP and others please contact office to see if we are a provider for your insurance.